If you’ve ever wondered how to roast pumpkin seeds, these recipes will get you started. 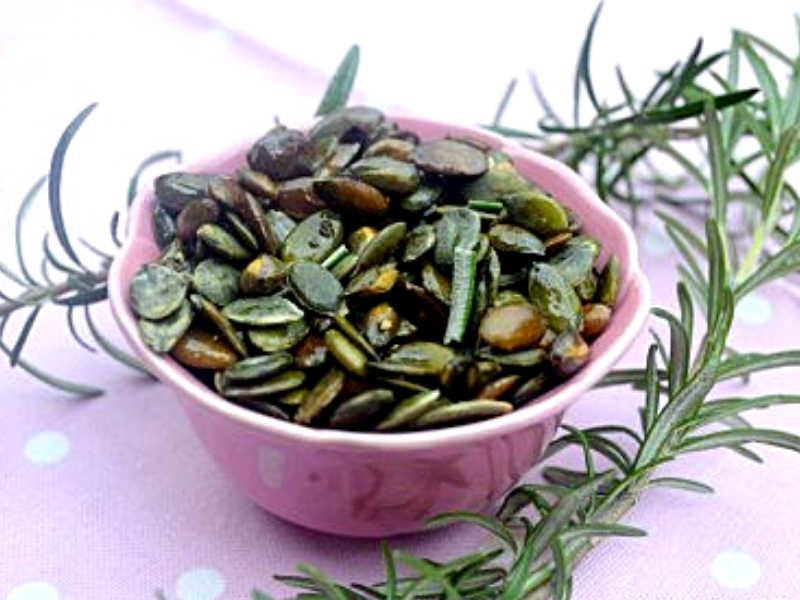 The pumpkin seeds recipe selection here gives you endless choices of snacks to make! Lots of flavor options! 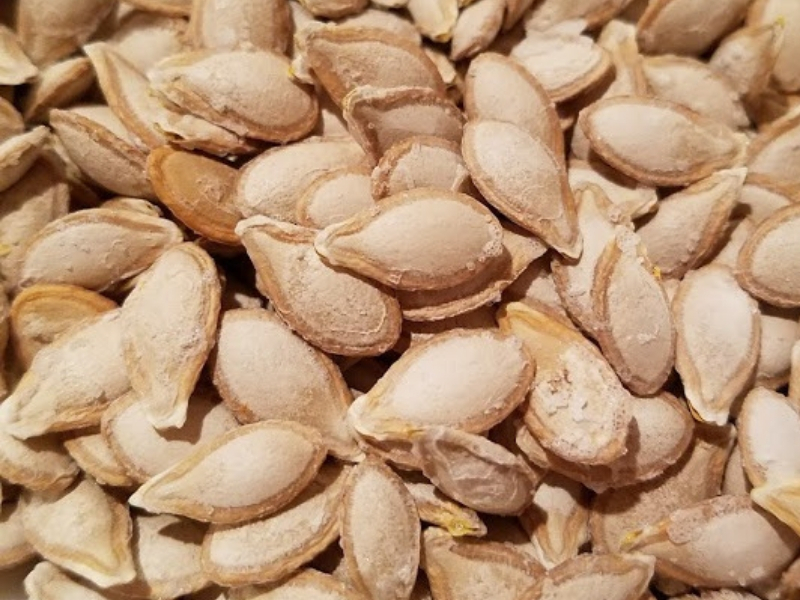 If you are lucky enough to have a supply of pumpkins (you may grow your own, or have a good local market or supermarket displaying these wonderful nutritious members of the squash family), make sure you save the seeds. There are some amazing flavored snacks that you can make from them. 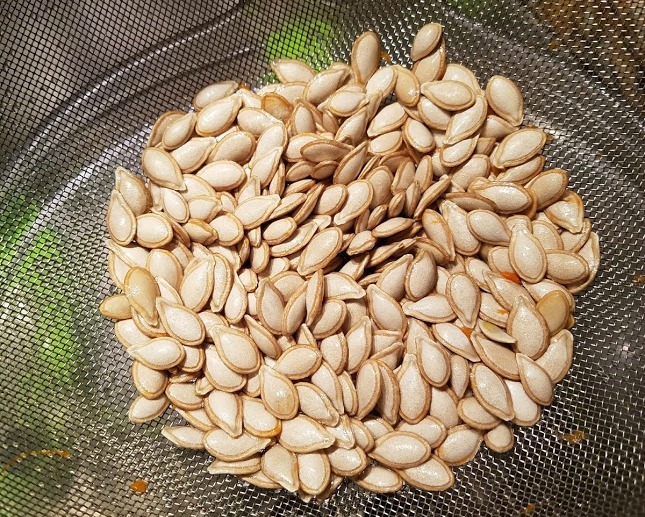 Why bother roasting pumpkin seeds? 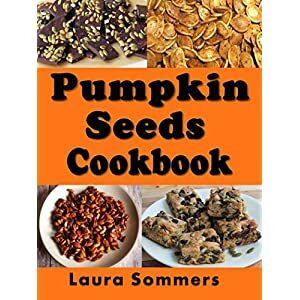 Pumpkin Seed Cookbook: Recipes for Pepitas and Pumpkin Seeds (Halloween Recipes Book 1) Because it’s easy to do and it’s good for you! Pumpkin seed recipes are so easy to make: it just takes a little time for a tasty end result. Growing pumpkins is a ‘full circle’ – from seed to fruit and back to seed again. Pumpkins are nutritional powerhouses, full of a variety of nutrients and plant compounds antioxidants to help you fight off infection and diseases. They will give your health a real added boost, and the seeds are no exception. Just for starters, they contain magnesium, zinc, copper, and manganese and are a great source of healthy omega-3 fats. Pumpkins are superfoods in the true sense. And pumpkin seed snacks are easy to transport for a quick energy boost, rather than reaching for a packet of potato chips or a chocolate bar! 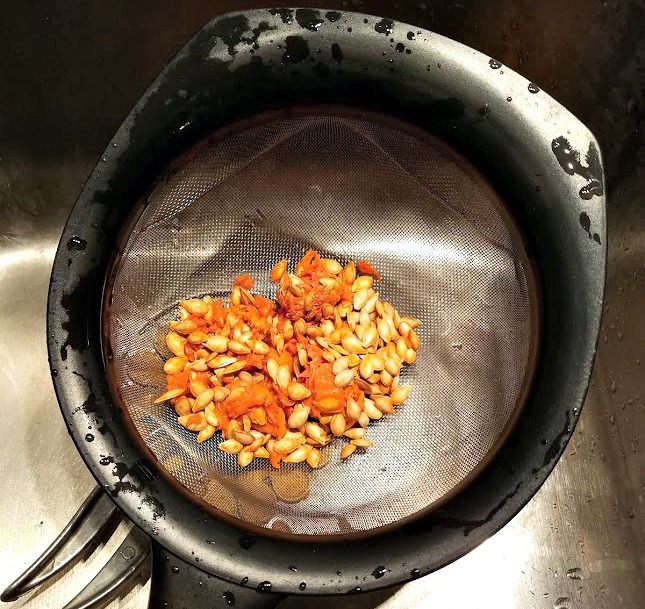 You know how I love experimentation 😉 Here are some great ideas for different seasonings and tastes for roasted pumpkin seeds. The most important part of the process is cleaning off the seeds before roasting. The simplest method I have found is to wash them in a sieve under running water, using my fingers to remove the ‘stringy bits’. Once cleaned, drain them and leave them to dry. This is the longest part of the process. Once dry, spread them out on a baking sheet or cookie sheet. And wouldn’t you know it? I forgot to take pictures of the remaining steps: I guess I was too excited to get these done so I can have a taste. I’m sure you can imagine it ;). 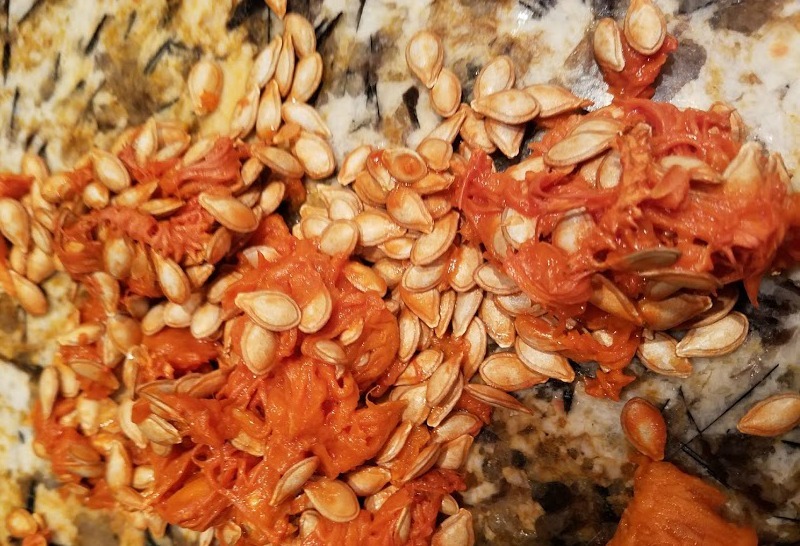 Roasting the pumpkin seeds helps seasoning to stick to them. We need it to stick to the seeds to give the divine flavor. I like to lightly baste the seeds with 3 tbsp of melted butter or vegetable oil and season with Himalayan salt, or any other natural salt that you like. Adding ground black pepper also gives them a lovely ‘punch’. heat the oven to approx 170F in advance and then roast the seeds for about 15-20 minutes. You will end up with a lovely crunchy snack to enjoy. Keep an eye on them! Ovens vary and some may take a little longer to cook, while others could be nicely roasted in under 15 minutes. You don’t want to burn the seeds. So what other flavors have I tried? Here are a few simple and delicious combinations to try from my selections. Of course, feel free to experiment with your favorite herbs and spices. 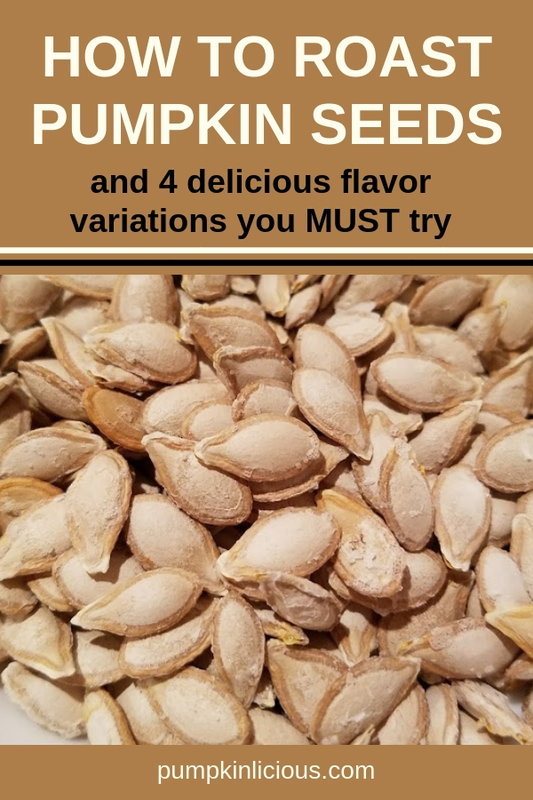 Pumpkin seeds have a delicious nutty taste and they are so easy to flavor. Add a 1 teaspoon (or a little more if you like lemon and a bit of heat) of lemon and pepper seasoning, such as McCormick (this is the one I use) or Mrs. Dash to 3 tablespoons of melted butter or oil. Add 1 tsp of chili seasoning (best to use a packet seasoning than a hot chili spice on its own) mixed with 3 tbsp melted butter or oil, and salt and pepper if you like more heat. Add ½ tsp of finely chopped rosemary and ½ tsp finely chopped thyme, with the salt and pepper to 3 tbsp butter or oil, for a real taste of Southern France. Try mixing these seeds with olives and a little crushed garlic for a tasty pre-dinner party snack with drinks. If you really crave a sweet snack that is still reasonably healthy, add 1 tbsp of maple syrup or natural honey to the 3 tbsp butter or oil. I tried this with a dash of pepper as well and they were yummy! These make a semi healthy snack. Not so healthy is the dark chocolate bark with pumpkin seeds, but pumpkin and chocolate is another story; one which I will talk about later. Do you have a favorite flavor for your baked pumpkin seeds? Please share below!